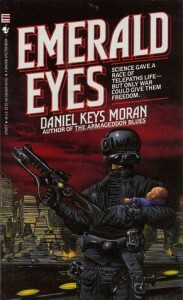 Emerald Eyes, Daniel Keys Moran, Bantam Spectra, 1988, ISBN 0-553-27347-7, $3.50, 243pp. 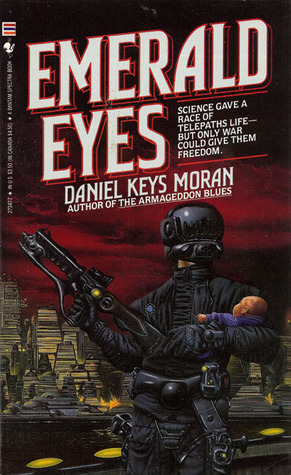 Long a favorite of the rec.arts.sf.written newsgroup, Daniel Keys Moran is an author who, by all rights, should be more popular than he is. Here is a writer who has an world so thoroughly mapped out that he plans thirty-two books to tell its entire story. While his influences are centered directly in the science fiction field, his plotting and writing are strong, if not subtle. What makes Moran so different from bestselling authors like, say, Orson Scott Card or Lois McMaster Bujold, who have similar influences and styles? Maybe it is because he is not as prolific as these two, and can’t satisfy the fan craving for one to two books a year? Let me get it straight here, and say that Moran’s writing is never going to win him any literary prizes. His goal is adventure on the grand scale, not style or depth of human understanding. Yes, he can touch on emotions, but it is the action–the events–that concern him. It is a proud science fiction tradition, of which Isaac Asimov was its chief adherent for so long. Moran’s a modern author, though, and while he writes in a traditional manner, his subject matter and some of his language would have been quite shocking in 1950. The timing of Emerald Eyes is in 50 years, when the United Nations has assumed control over the earth, sometimes by force as in the case of Japan and the United States. The French, who backed the UN early, are the ethnicity that now is in the ascendancy. Trying to genetically engineer humans to be better soldiers for them (to help control what they view as endless resistance), they create a race of telepaths, the first of which is Carl Castanaveras. Most of the novel is about Carl’s struggle to free the telepaths (numbering almost 350 after thirty years of gene splicing and cloning experiments) from being slaves in the service of the U.N.’s peacekeeping force. There’s a lot going on beyond that in this novel, because of the depth of Moran’s world building. The story may follow one plot, but there’s many more sub-plots going on that intermix with the major plot, and while some of them are resolved, many of them are left to be the subject of later volumes. In most cases, this would be extremely annoying, but Moran makes it work through a combination of first person and third person narration, and through the jutzpah of trying to envision a series involving time travel in such detail. After finishing Emerald Eyes, it is hard not to desire more, to find out exactly what was going on with Camber Tremodian and his prey, what the House of November was and what was its gift, what a Long Run entailed, and who was Lady Blue. This is stuff that cults are built around, and Moran has his faithful. But, for some reason, none of the faithful seem to be publishers. There have only been three novels of the Continuing Time published (I think–I was trying to figure out if Moran’s first novel, Armageddon Blues, was a Continuing Time novel or not), and recently Moran bought the rights to the books back. His most recent effort is a collaborative novel with his sister that I do not believe is in this series. I enjoyed Emerald Eyes, and I’ve been told that The Long Run is even better. If it is, I might have to join the faithful and queue up to wait for future volumes, even if Moran has to self-publish them.